Have you ever watched undercover boss? If you haven’t then the premise is a boss of a large company goes undercover and works alongside his employees for a week to get a better understanding of how the business is doing. They give the boss a makeover so he is not recognised and are told the reason there is a film crew is because they are making a documentary about people changing careers. At the end of the show, the members of staff that the boss worked with over the course of the week are invited to the company’s headquarters, the ones who have performed the best get some kind of reward. They may have shown great initiative or have worked really hard. The reward usual comes in the form of a holiday, help with a charity that is close to their heart and even on some occasions a promotion. You are probably wondering what this has to do with inbound marketing? I remember watching the American version one night with my wife and it was all about 1-800 Flowers, one of the biggest flowers franchises in the USA. It was amazing to see what two brothers achieved with this company and to see some of the wonderful people who worked there. We always try to do just that here at Stargazer. This is not only true for inbound marketing but for every kind of business on the planet. People buy from people. The relationship you have with your clients and customers doesn’t end when you make a sale, they begin. If you are an online store it is harder to build a relationship before your customers purchase a product, however making your website easy to use and buy from, is a form of relationship building. With online sales it’s not until they have pressed the “buy now” button that the real relationship starts. It is this step that a lot of online retails forget about or maybe they just don’t care. They have made a sale, right? Why should they care? For me this is one of the biggest mistakes to make and will really damage the growth of your business. No amount of advertising or special offers will turn a customer into a happy one. It is your products, actions and the actions of your staff that create happy customers. How do you create a caring culture for your business? Showing your customers you care is a very important step to achieving customer satisfaction. Everyone makes mistakes but it’s not so much about the mistake as it is about how you rectify it. The customer should always feel listened to. It’s great to have this caring attitude yourself but how do your replicate that throughout the whole of your company, with every member of staff. You need to hire people that share the same passion and beliefs as you do. Make your company’s goals very clear. The people you hire need to understand what the goals of your company are and they have to believe in these goals. Your employees will treat customers the same way as you treat them. Always let them take the credit when something goes well and when things go wrong, you as a leader must step up and take the blame. Sometimes you have to let them make mistakes even when you know you are right. You must nurture and encourage them to be the best they can be. Be transparent, not only with your customers but also with your staff. This will help build trust and empathy. Listen to them and take on board their ideas on how to improve the business. What are the benefits of great customer services? There are so many benefits to having great customer services. Think of the lifetime value of a satisfied customer, think of the recommendations that customer will make. The graph below shows the effects of sales growth on customer satisfaction in the retail sector. Your satisfied customers will be your greatest brand advocates who will sing your praises from the roof tops. 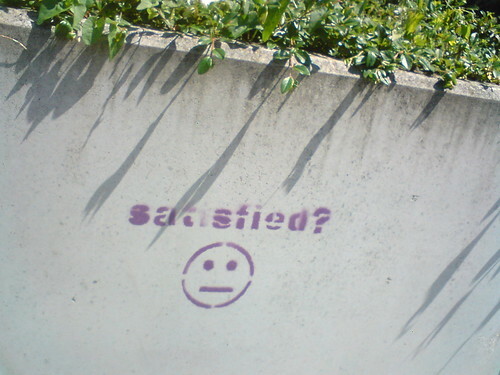 So why not create a customer survey to find out how satisfied your customers are? They may just surprise you. We would love to hear about great customer services you have experienced. If you own a business, what steps have you made to ensure your customers are happy?